Have you ever considered meditating, but didn’t follow through because you thought it wasn’t for you? Have you ever asked, “What exactly is meditation anyway?” If you’ve already begun meditating, do you struggle to know when is the best time and how to go about it? Meditation is one of the most misunderstood, yet incredibly beneficial practices out there, and chances are that you have a lot of questions. Whether you’re just curious, newly beginning your meditative journey, or already an advanced practitioner, The Meditation Transformation: How to Relax and Revitalize Your Body, Your Work, and Your Perspective Today is an informative and interesting guide to the basics of meditation from A to Z. Who should meditate? Find out exactly who the perfect candidates for this practice are. Are you one of them? What exactly is meditation? Though it has been performed for thousands of years, meditation is still a misunderstood activity. What qualifies as meditation? When is it appropriate to meditate? What time of day is best? Should you meditate every day? Discover the answers inside the pages of this book. Where should you meditate? Learn what a good atmosphere for meditation really is. Can you really meditate at work? Or is it best to do so at home, and if so, in which room? Why meditate? This is one of the most significant questions of them all, especially because most of its benefits are so little known. Of course, you are aware that it can reduce stress and bring peace of mind, but what about all of the other spectacular health benefits it can provide? And is it true that regular meditation can really improve your focus and your memory? How do you go about meditating? If you’ve already determined to begin, this is the big question. 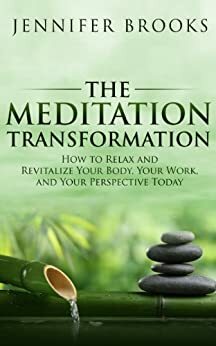 The various forms of meditation are not one-size-fits-all, so while this book provides you with the basic technique, it also takes you by the hand through several other variations that you can try. Whatever your reasons are, it’s never a bad time to start, and by the time you've finished reading this book, you'll be ready to adopt your own meditative practice as a vital part of your daily life. To learn more about the powerful benefits of meditation and experience them for yourself, download your copy of The Meditation Transformation: How to Relax and Revitalize Your Body, Your Work, and Your Perspective Today now! This book mentions the science behind meditation and several different types of meditation briefly. This was my first try at meditation and found this book helpful. Also tried the free audio that the book mentioned and I found it useful mostly for someone with body image issues. The author mentions that this is just an introduction and one can do further research into each type of meditation. I appreciated that the Kindle version was free. this great book is not just for free to readers, but describes mindfulness and meditation in a a really simple and understandable way. i am an spanish speaker and for me is not just that i realy thank jennifer brooks for the book, but because she helps to get something that is not easy at all in the simplest way possible. i'll give you a clear example; since the mind is almost always wondering, is very difficult to keep on focusing only in the breath, that is why is advisable to start practicing zen counting 1 to 10 breaths, jennifer brooks said in this book i can start by counting three breaths, now i do that even when i go jogging and makes a big difference. i will recomend the meditation transformation and "zen meditation magic" both, in spanish and english, although every single jennifer's book is a incredible. I read this book cover to cover in two easy sittings. If you’re pressed for time, you could probably do it in a week, setting aside 15-20 minutes per session. It’s very easy to read, and filled with useful suggestions for the beginner. If you’re new to meditation, I recommend this book simply for its simplicity and the author’s chatty, approachable writing style. If you’re looking for something deeply analytical, with more clinical evidence of the benefits of meditation, you’ll likely find this to be a little thin in that department. 5.0 out of 5 starsThis is a super helpful book. It benefited me greatly! Since I am fairly new to meditation, I was delighted to discover thus eBook on Amazon. While the book is a bit basic, it has very helpful information in it. 1 What Are The Benefits Of Meditation...this described how one can improve conditions such as chronic diseases. Also it describes that meditation can lower blood pressure, aid in healing and more. 2 Meditation and Weight Loss. This us a very insightful part of this book. 3 Meditation for headaches...my favorite one. This also worked on my chronic shoulder pain. 4 My all time favorite chapter is called How Meditation Changes Your Brain. I tried this suggestion and meditated for 20 minutes. What I did was to listen to very, very soothing instrumental music on very low. I also was lying down. After the meditation, I felt super relaxed and my mood was very positive. I've read quite a few books on meditation and though many of them are still worth reading, they often have long poetic sections claiming to be self conformations or personal mantras. I personally think a lot of that stuff is worded in a very cheesy way. This book keeps that to a minimum while providing detailed information about the act of meditation and advice that seems to come from a lot of experience. Contained the most useful information out of the few books I've read, and its the most tastefully written. 5/5.